On what was hopefully one of the few remaining sweltering days of the summer, DCC took on a pretty tame looking punk cover band, the Six Pistols (who then turned out to actually be covering the Dubai Exiles). Skipper Ash won the toss and DCC subsequently padded up; the boys looking forward to watching a few strokes from the shade. Etienne and Rach got proceedings underway with Rach scoring 7 (8) before snicking off to a surprisingly good take from the ‘keeper. Colin joined Etienne and built a solid partnership against what seemed to be a decent opening bowling pair who bowled out the first 8 overs for 38-1. Etienne then found the turbo as the 1st and 2nd change bowlers came on and proceeded to begin stroking boundaries at a rate of knots, finishing Caught and Bowled (to another one handed take) with 61 from 40 balls (3x4s, 5x6s). At this point, Higgens joined for a rusty 13 (16 including one boundary) as Colin was going through the gears (finishing on 57 being run out off the last ball of the innings (6x4s). Kirky chipped in with 6 off 4 as the innings closed on 157 for 4 down. 20 to 30 runs short of what was believed to be par in 20 overs. As Darjeeling took to the field, Kirky’s overwhelmingly energetic Swans support had translated into some serious banter from mid on, however, unfortunately, DCC couldn’t replicate the energy with the ball and the Six Pistols moved quickly to 40-0 off 4 overs with good balls being produced by both Rohan (2-0-25-0) and Etienne (2-0-20-0) but the bad ones being taken full advantage of with the field up. With the start of the innings highlighting that the Six Pistols seemed to only possess one batsman (Hassan aka Hussey-wanabe), the middle period showed a good combination from DCC of experience and youth with Ash (3-0-19-0), Thomas (4-0-21-1) and Aryan (3-0-33-0) compiling some decent pressure as the pace came off the ball (and the batsman’s wind up grew). Unfortunately, a dramatic Darjeeling come back wasn’t to be and we were indeed shown to be 20-30 shy of a par target with Six Pistols (Dubai Exiles) winning by 9 wickets in the 19th. 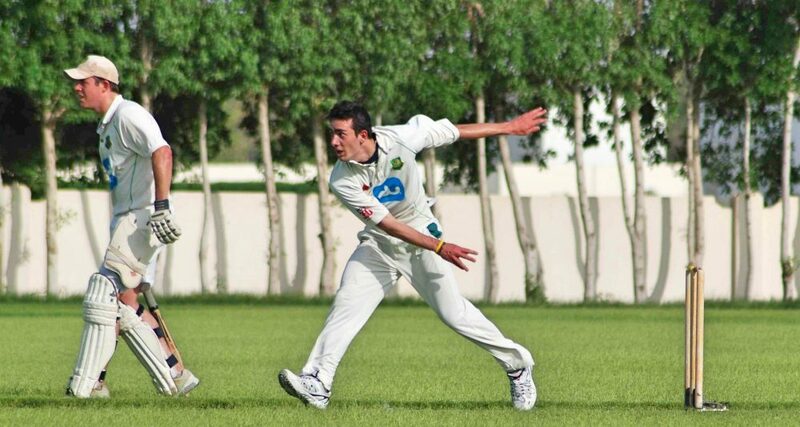 This entry was posted in Club News, ICC Academy, Match Report and tagged 2016, Amateur, Cricket, Cricket in Dubai, Cricket in the Middle East, Cricket in the United Arab Emirates, Cricket Match, Dubai, ICC Academy, Match Report, September, Sport, UAE. Bookmark the permalink.